Operational efficiency is a critical factor in the fluid processing industry. The synergy of fitting components and assembly technology to achieve this objective is the focus of Fit-Line Global (Fit-Line). Applying extensive polymer technology and injection molding expertise, the company has analyzed the design, tooling and manufacturing processes required to create high-performance solutions for demanding high-purity fluid processing applications. Through extensive R&D, testing and evaluation, Fit-Line Global has isolated three variables that need to be addressed to ensure leak-free fitting assemblies. The first variable is the quality of fittings. Producing fittings for the semiconductor, pharmaceutical, biotech, life science and ultra-pure water industries requires adherence to extremely stringent quality standards. Fit-Line Global manufactures FlareLINK standard and custom PFA and PVDF fittings using precise design, high-quality resins and advanced injection-molding technology. From engineering to packaging, all processes are handled in-house for maximum production quality control and fast order turnaround. To eliminate cross-contamination, dedicated molds and process equipment are used exclusively in component production. Proprietary cleaning and packaging processes are conducted in an ISO 14644 Class 1000 Clean Room. The industry-accepted standard process of flaring tubing on-site using a handheld heat gun can introduce several quality control issues. Research has shown that the problems inherent to this fabrication method include inconsistent and uneven heating of tubing circumferences, limited repeatability and the excessive amount of time required to create precise tube flares. To eliminate errors and reduce rejection rates, the use of well-designed, semiautomated hot tube flaring systems has proven to be an effective method to create precise, standard and repeatable tube flares. Fit-Line’s uniquely-engineered bench top and mobile TruFLARE systems feature custom heaters and mandrels that form and rapidly create flared tube ends for standard size fluoropolymer tubing. A key advantage of these systems is that the flared tube ends do not require immediate assembly, which is often the case with other rudimentary hot flaring systems. Application results using this flaring technology have demonstrated significant improvements over alternative flaring methods. In studies measuring fabrication time, it has been reported that high-throughput tube flares can be created substantially faster. Customer applications show that time required to create accurate tube flares can be reduced to five minutes or less. In addition, it has been reported that the use of TruFLARE technology has resulted in measurable decreases in rejection rates and material cost savings. The final variable isolated by Fit-Line in the pursuit of leak-free fitting assemblies is the method used to tighten assemblies to the required torque value. Hand tightening, a commonly-used practice, will not produce a consistent and accurate flared assembly seal. This method is dependent on a person’s hand strength. To eliminate this variable and correctly tighten nuts to a required torque value, a separate torque wrench and nut adapter is used. While the use of a torque wrench and nut adapter can provide more consistency, this combination is more complicated. This requires additional training and time for torque calculations. The wrench design offerings prevalent in the high purity fittings industry present an ergonomic challenge, since they must be properly aligned with nut splines. To avoid calibration difficulties and labor-intensive processes, skipping the use of a torque wrench and overtightening to ensure a tight seal might seem like the best approach. However, overtightening creates stress on the plastic that might not be apparent immediately, but when in use will result in leaks. 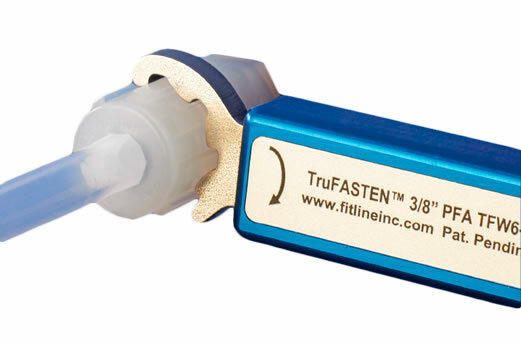 After extensive engineering and market research, Fit-Line developed TruFASTEN, a proprietary technology designed to ensure leak-free assemblies. Simplicity of use is an important characteristic of this tightening solution so that the procedure can be readily adapted into the production process. Calibrated to preset torque values based on nut size, the wrench claw clicks over when required torque value is reached. A quick ratcheting action allows the nut to be rapidly tightened. TruFASTEN’s compact design fits easily into hard to reach spaces and is available in five different sizes. Wrenches are color-coded for use with PFA and PVDF nuts. To validate the integrity of Fit-Line fittings assembled with TruFLARE tube flaring systems and TruFASTEN torque wrenches, we performed a series of temperature and pressure tests using PFA fittings with PVDF and PFA nuts. The objective of this test is to determine the best assembly methods required to maintain a leak-free flare assembly while withstanding mechanical stresses induced by alternating high and low temperature and pressure cycles. The test applies to ¼-inch, 3/8-inch, ½-inch, ¾-inch and one-inch fitting assemblies. A master assembly that includes all five fitting sizes along with PFA tubing is to be pressurized with deionized water from 20 psi to 120 psi and water temperature to be cycled from 18⁰C to 95⁰C. A master assembly was built to test a series of fitting assemblies that included five sizes, ¼-inch, 3/8-inch, ½-inch, ¾-inch and one inch. Refer to Figure 1. Each tube was flared using Fit-Line’s TF416 and MTF416 TruFLARE units and each nut was tightened using TruFASTEN torque wrenches. Each nut was tightened at room temperature. Cycle 1 was set at 18⁰C for 80 minutes with intermittent pressure cycles at 20 psi and 120 psi. Each pressure cycle was held for 5 minutes. In summary, Cycle 1 subjected the master assembly to 18⁰C at 20 psi for 40 minutes and 120 psi for 40 minutes. Cycle 2 is the same as Cycle 1, except the temperature was set at 95⁰C. The difference in temperature and pressure was created to expand and contract the connections within the master assembly to test the integrity of the seals. The fittings and flared connections were stressed by expansion and contraction due to changes in temperature and varying pressures for 150 hours. None of the fittings leaked upon the conclusion of the test. One notable observation was made: under Condition D (95⁰C at 120 psi), the one-inch tubing expanded by five percent, 1.00 to 1.05. Tube sizes ¼-inch to ½-inch expanded by three percent and ¾-inch expanded by five percent. The tubing expansion and contraction verifies that each fitting connection experienced cyclic stresses without any leaks. This research demonstrates the critical relationship between quality assembly elements and innovative production methods, as well as how they contribute to efficient, leak-free fitting assemblies. To learn more about how Fit-Line’s focus on innovative engineering can help you achieve maximum productivity and the highest levels of quality processing, contact a Fit-Line Global representative today.